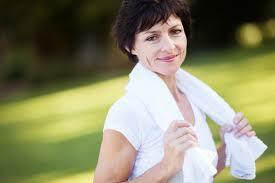 Why is Exercise before, during and after Menopause so important for Women? Menopause (the natural cessation of menstruation that usually occurs between the ages of 45 and 55) is a time of change – often coinciding with other life changes such as family structures, relationships, careers. Some changes can be positive but also often negative and resulting in feelings of increased stress Exercise is proven to have a significant , positive impact on mood and may help one cope with these many changes in their lives by increasing endorphins released by the brain and ultimately ‘feeling better’. During Menopause why there is more risk of Osteoporosis? We often read and hear that during Menopause a woman’s risk of developing osteoporosis increases; and it is due to the changes in female hormone levels. The drop in Estrogen levels that occurs around the time of menopause results in increased bone loss. It is estimated that the average woman loses up to 10 per cent of her bone mass in the first five years after menopause (1). Are there certain types of exercise that are better for Menopause? To reduce the risk of developing Osteoporosis, eating a diet rich in calcium and doing regular weight-bearing exercise such as walking is important. This can be maintained years before Menopause even begins! Resistance training exercises such as using strength machines and light dumbbells are important for strengthening muscles attached to bones. Stronger leg muscles for example may improve balance and consequently help prevent falls. Unfortunately for many elderly post Menopause falls and result in a severely diminished quality of life due to injury and are sometimes fatal. How can exercise may help prevent weight gain during Menopuase if I don’t have a lot of control over my hormones? The change in hormone levels associated with menopause may affect the body’s metabolism and ability to burn calories/ fat. We live in an age of medical advancement where some medically prescribed drugs assist in the balance of hormones however mother nature still cannot always be fought. Many studies have found that weight gain after menopause is more likely in women who are sedentary than in women who maintain a physically active lifestyle. (2) Reducing the chance of the body increasing it’s fat levels (especially areas inside/ around the vital organs such as abdominal area) also reduce their chances of developing or exacerbating diseases associated with higher visceral fat levels such as diabetes and heart disease. The GOOD news – A change in life can = more fun in life! Exercise should add fun and energy to your life, so find ways of moving that you enjoy! Exercise can be a great way to stay connected with like minded people and help build new friendships with those going through similar experiences. 1) Better Health Channel https://www.betterhealth.vic.gov.au/health/conditionsandtreatments/menopause-and-osteoporosis; 2016. Eat, drink & train… and you will SURVIVE THE SILLY SEASON!